Prichett (DD–561) was laid down 20 July 1942 by the Seattle-Tacoma Shipbuilding Co., Seattle, Wash.; launched 31 July 1943; sponsored by Mrs. Orville A. Tucker; and commissioned 15 January 1944, Comdr. Cecil T. Caulfield in command. Following shakedown Prichett sailed, 1 April 1944, for Majuro, thence to Manus where she joined the battleships of Task Force (TF) 58. On the 28th, the seven battleships and 14 destroers of Task Group (TG) 58.3 sortied and, rendezvousing with the fast carriers of TG 58.1, steamed northeast. On the 29th and 30th, while carrier aircraft bombed and strafed Japanese held airfields in the Carolines, Prichett served in the screen, where she rescued two Lexington (CV-16) aviators who ditched their damaged Grumman TBF Avenger. The next day, the surface warships bombarded wharfs, seaplane bases and other installations on Ponape before the entire force retired to Majuro, whence Prichett returned to Pearl Harbor. There fighter director equipment was installed and on 30 May she sailed west again, with TF 52 for the invasion of Saipan. Having screened the transports to the objective, Prichett shifted her protective duties to the battleships as they bombarded the shore, then provided gunfire support to the troops landed on 15 June. A highlight of this operation was the rare rescue of a Japanese aircrewman, picked up on the 18th after his plane splashed nearby. During the 19-20 June Battle of the Philippine Sea she remained with the transports, then turned her guns on the neighboring Japanese held island of Tinian. Remaining in the Marianas until mid-August, the destroyer alternated gunfire support duties, screening duties and radar picket duties off Saipan with bombardment of Tinian until that island was invaded 24 July, then provided support services for the troops fighting there. In August she shifted to Guam to support mopping up operations and on the 17th got underway for Eniwetok to rejoin the fast carrier force, now designated TF 38. Arriving on the 20th, the warship sortied with TG 38.3 on the 29th for planned strikes against the Palaus and the Philippines. During the approach, Prichett rescued a pilot from Langley (CVL-27) on 30 August, but then lost one of her own a week later when Seaman First Class J. R. Brassell fell overboard during refueling operations. On 9 September, as the carriers launched air strikes against Japanese installations on Mindanao, light cruisers Birmingham (CL-62), Santa Fe (CL-60) and four destroyers, including Prichett, ambush a Japanese coastal convoy of over two dozen small craft off Mindanao, sinking or beaching every one. For the next two weeks, the carrier task group struck targets in Mindanao, the Visayas and even Luzon, taking a diversionary sweep back south on the 15th to pound Peleliu for four days before hitting airfields around Manila on the 21st and 22d. After rearming at the temporary anchorage at Ulithi, the force sortied again on 6 October, intending to strike airfields on Nansei Shoto, Luzon and Formosa in preparations for the upcoming landings in the Philippines. Following a fighter sweep raid over northern Luzon on 11 October, the TG sailed north to strike Formosa. Unfortunately, during an alert caused by Japanese air raids just after sunset on 12 October, a destroyer from the screen of TG 38.4 accidently opened fire on Prichett with a 40mm machine gun, mortally wounding one sailor and wounding 15 others. Despite the casualties, the warship resumed screen duties for three more days -- during which her 5-inch guns knocked down an enemy bomber at extremely long range -- until retiring to Manus for repairs and replenishment. From the Admiralties, she steamed to Ulithi and rejoined TG 38.3 for further strikes against Luzon and the Visayas in early November, further whittling down Japanese airpower in the region. While on screen gurad, Prichett rescued two Essex (CV-9) pilots who ditched aircraft near the destroyer on 13 November. The force returned again to the Luzon area in late November, with Prichett escorting carriers during air strikes against Japanese bases there. On the 25th her crew witnessed a kamikaze strike that damaged carrier Essex. After returning to Ulithi at the end of the month, the carriers put to sea again on 11 December, this time striking the Manila Bay area during the landings on Mindoro. The destroyer rescued another flier on the 15th before an approaching typhoon broke off combat operations. On 30 December the Ulithi logistics base was left behind again as the force steamed west to welcome the new year with strikes against Luzon on 6-7 January 1945 and Formosa on the 9th. The carrier TG then steamed into the South China Sea to strike at enemy coastal shipping as far south as Saigon in French Indochina. Returning north, the carriers conducted fighter sweeps over Hainan, Amoy and Hong Kong in China before hitting the Japanese on Formosa again. They then retired to Ulithi, replenished, rearmed, and, on 10 February, departed to raid the industrial complexes of Honshu. After striking Tokyo and Yokohama, the force turned back to cover the landings on Iwo Jima, 19 February. There Prichett was reassigned to TU 52.2.5, with which she remained in the Iwo Jima-Chichi Jima area until 9 March. By 12 March, DD-561 was back at Ulithi to prepare for the invasion of Okinawa. Attached to TF 54, Prichett arrived off the objective 25 March to cover minesweeping and underwater demolition team operations. Preinvasion bombardment, harassment fire and fire support missions off Kerama Retto followed. On 1 April, she participated in the demonstration “feint” on southern Okinawa, then swung around to screen the transports off the Hagushi assault area. At dawn the next day, a single Japanese aircraft made a surprise run on the destroyer, catching the spotters unaware and dropping a 500-pound bomb a scant 20 yards off the port beam. It was a sign of things to come, for later in the day Prichett took station on the radar picket line - a ring of ships serving as an outer warning net to detect enemy air raids - against which the Japanese directed many of their air raids. Just after 0100 on 3 April, several enemy groups were picked up on radar. Four aircraft were then spotted visually at 0129 and, although the first was shot down and the second driven off, the second two closed the warship, with one dropping a 500 pound bomb on the fantail. Exploding close under the counter, the bomb holed the destroyer below the waterline, causing flooding aft and a fire in the 20mm clipping room. The destroyer, maintaining a speed in excess of 28 knots to minimize flooding and bring the fire under control, continued to ward off enemy planes -- shooting down two others that pressed their attacks too close. Relieved by Brush (DD-745) shortly before noon, the damaged destroyer retired to Kerama Retto for emergency repairs. On the 7th, she got underway for Guam and a month of extensive repairs. Prichett departed Guam on 3 May in company with Shipley Bay (CVE-85) and returned to Okinawa on the 7th. Although she resumed dangerous radar picket duties soon thereafter, the warship escaped further damage for almost three months -- though it was not for lack of trying by the Japanese. On 29 July, Prichett was steaming on pickett duty when an antiquated Japanese biplane snuck in under the radar and crashed destroyer Callaghan (DD-792) at 0040. Closing to rescue survivors blown into the water, Prichett ran up alongside to assist Callaghan's crew fight the extensive fires. In the fire-lit darkness, the ships proved an easy target and a second aircraft closed in. Despite being taken under fire at 5,000 yards, the Japanese kamikaze bore in, came up the starboard side, banked left and crashed six feet from the waterline. The aircraft bomb exploded on contact, stoving in the hull, damaging the superstructure and killing two sailors. Despite ther damage, Prichett remained in the area for another two hours picking up survivors from Callaghan. Awarded a Navy Unit Commendation for her actions off Okinawa, Prichett sailed for home 13 August. Arriving after the cessation of hostilities, she underwent preinactivation overhaul at Puget Sound and on 14 March 1946 was decommissioned and berthed with the San Diego Group, Pacific Reserve Fleet. Reactivated after the invasion of the Republic of Korea by the North Korean People’s Army, Prichett recommissioned 17 August 1951. Post activation shakedown off California followed and on 13 January 1952 she got underway for the Atlantic. Arriving at Norfolk, 2 February, she operated off the Mid-Atlantic seaboard until April, then underwent modernization at Boston. Emerging in November with the latest in anti-aircraft weaponry, fire control radar, sonar and communications gear, she became the flagship of DesDiv 282. She completed further training in the Caribbean and departed Norfolk, 4 January 1953, for a tour in the Korean combat zone. Steaming via the Panama Canal, she arrived at Sasebo 11 February and on the 15th rendezvoused with TF 77. Between then and 23 June she performed plane guard and screening duties for the carriers of TF 77, screened battleships and cruisers during bombardment missions, and provided gunfire support at Wonsan Harbor and the Hungnam coast, plane control, interdiction and harassment fire, as well as hospital ship services for the Marines fighting in coastal areas, primarily near Wonsan. Prichett steamed towards Norfolk on 26 June 1953 and completed her round-the-world cruise 22 August via Manila, Singapore, Columbo and Aden to the Suez Canal, then Athens, Genoa, Cannes, Algiers and Gibralter. 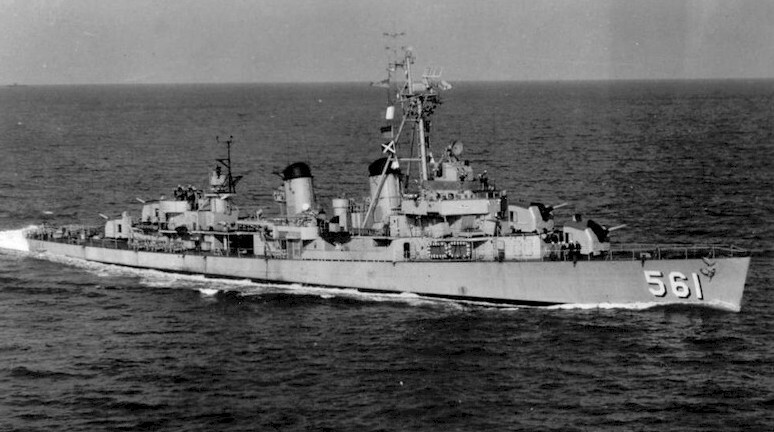 After a modernization overhaul at Norfolk, the destroyer deployed to the Mediterranean for a three-month cruise between 7 January and 11 March 1954. Then, after exercises in the West Indies and a shipyard availability, she got underway, 5 January 1955, to return to the Pacific. Assigned to DesDiv 192, the destroyer reported to CinCPac 17 January and by May she was enroute to Japan for her first WestPac deployment since the Korean War. Homeported at Long Beach for the next nine years, she alternated 7th Fleet tours, Fleet exercises and Taiwan Strait patrols with training operations, including sonar and gunnery school ship assignments, off the west coast. Highlights of these years included training exercises with Japanese and South Korean naval forces as well as ASW patrols in the Sea of Japan and the Taiwan Straits. She also responded to maritime emergencies and distress calls, such as the 5 April 1961 explosion and fire that crippled Chinese Nationalist tanker Kwang Lung in Kaohsiung harbor, Taiwan. Fire fighting crews from Prichett reached the stricken vessel in minutes, helping to control the blaze and avert a major disaster. Later in June, the destroyer towed a stranded Japanese fishing boat into Kaohsiung. In August 1964, however, her 7th Fleet deployment was extended and, for the third time, she joined in combat operations in the western Pacific. On 30 August 1964 she joined TF 77 in the Tonkin Gulf and until mid-October operated in the South China Sea in support of South Viet Namese and American operations against North Viet Namese and Viet Cong forces. Homeported at San Diego on her return, Prichett began a cycle of combat tours to Vietnam that would last for the next five years. 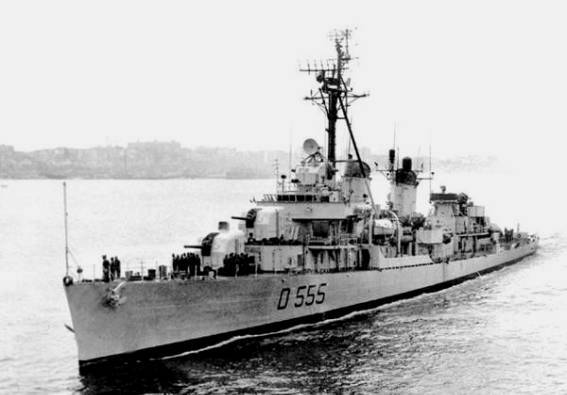 Her first full deployment to Vietnam took place between 27 April and 3 November1965, during which the destroyer screened carriers operating at Yankee Station and conducted shore bombardment missions at Chu Lai and near Danang. Her second deployment, between 2 July and 3 December 1966, was spent mostly on the gunline in IV Corps military zone off South Vietnam, attacking Viet Cong concentrations around the Saigon River. She also conducted radar picket duty in the Tonkin Gulf. After a six months of modernization work in mid-1967, Prichett sailed on her third tour on 18 November, beginning gunline operations in late December off the Cue Viet River. These gunfire support missions were particularly useful in February 1968 during the Vietnamese Tet offensive, when Prichett's guns proved critical during the month-long battle for Phan Thiet. Her fire was so accurate and steady that captured Viet Cong fighters said they'd nicknamed the warship "The Mortar from the Sea." After combat operations ebbed in March, the destroyer returned home on 26 May. After spending almost a year undergoing repairs, upkeep and local training operations, including a major Fleet exercise in March 1969, Prichett conducted one last Vietnam deployment beginning on 4 June. While still underway, however, the warship was scheduled for survey and, upon arrival home, Prichett was inspected on 5 December. Recommended for disposal on 17 December, the destroyer sailed to the Inactive Ship Facility at San Diego and was decommissioned 10 January 1970 and struck from the Navy List that same day. A week later the destroyer transferred to Italy in an "as is where is" condition. The destroyer served in the Italian Navy as Geniere (D 555) until disposal sometime during 1975. 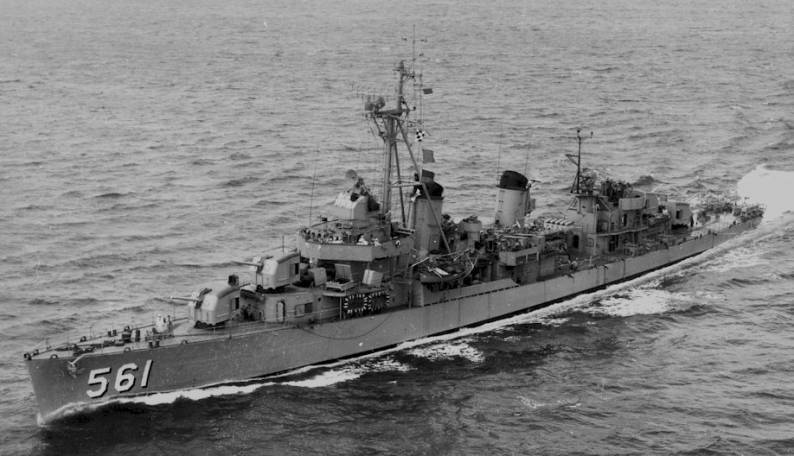 Prichett earned eight battle stars during World War II, two during the Korean Conflict and six battle stars for Vietnam service.